The illustration shows a cross-section of part of the cochlea, the fluid-filled part of the inner ear that converts vibrations from incoming sounds into nerve signals that travel to the brain via the auditory nerve. University of Utah and Baylor College of Medicine researchers found evidence that stereocilia -- bundles of tiny hair-like tubes atop "hair cells" in the cochlea -- dance back and forth to mechanically amplify incoming sounds via what is known as the "flexoelectric effect." Credit: William Brownell, Baylor College of Medicine. Utah and Texas researchers have learned how quiet sounds are magnified by bundles of tiny, hair-like tubes atop "hair cells" in the ear: when the tubes dance back and forth, they act as "flexoelectric motors" that amplify sound mechanically. "We are reporting discovery of a new nanoscale motor in the ear," says Richard Rabbitt, the study's principal author and a professor and chair of bioengineering at the University of Utah College of Engineering. "The ear has a mechanical amplifier in it that uses electrical power to do mechanical amplification." "It's like a car's power steering system," he adds. "You turn the wheel and mechanical power is added. Here, the incoming sound is like your hand turning the wheel, but to drive, you need to add power to it. These hair bundles add power to the sound. If you did not have this mechanism, you would need a powerful hearing aid." The new study is scheduled for publication Wednesday, April 22 in PLoS ONE, a journal published by the Public Library of Science. The first author is Katie Breneman, a bioengineering doctoral student at the University of Utah. The study was coauthored by William Brownell, a professor of otolaryngology (ear, nose and throat medicine) at Baylor College of Medicine in Houston. The researchers speculate flexoelectrical conversion of electricity into mechanical work also might be involved in processes such as memory formation and food digestion. Previous research elsewhere indicated that hair cells within the cochlea of the inner ear can "dance" - elongate and contract - to help amplify sounds. The new study shows sounds also may be amplified by the back-and-forth flexing or "dancing" of "stereocilia," which are the 50 to 300 hair-like nanotubes projecting from the top of each hair cell. Such flexing converts an electric signal generated by incoming sound into mechanical work - namely, more flexing of the stereocilia - thereby amplifying the sound by what is known as a flexoelectric effect. "Dancing hairs help you hear," says Breneman. The study "suggests sensory cells in the ear are compelled to move when they hear sounds, just like a music aficionado might dance at a concert. In this case, however, they'll dance in response to sounds as miniscule as the sound of your own blood flow pulsating in your ear." In a yet-unpublished upcoming study, Rabbitt, Breneman and Brownell find evidence the hair cells themselves - like the stereocilia bundles atop those cells - also amplify sound by getting longer and shorter due to flexoelectricity. Rabbitt and Brownell estimate the combined flexoelectric amplification - by both hair cells and the hair-like stereocilia atop hair cells - makes it possible for humans to hear the quietest 35 to 40 decibels of their range of hearing. Rabbitt says the flexoelectric amplifiers are needed to hear sounds quieter than the level of comfortable conversation. "The beauty of the amplifier is that it allows you to hear very quiet sounds," Brownell says. Rabbit says that because hair cells die as people age, older people often "need a hearing aid because amplification by the hair cells is not working." Because hair-like stereocilia also are involved in our sense of balance, the flexing of stereocilia not only contributes to hearing, but "also likely is involved in our sense of gravity, motion and orientation - all the things needed to have balance," Rabbitt says. The new study is part of an effort by researchers to understand the amazing sensitivity of human hearing. Rabbitt says the hair cells are so sensitive they can detect sounds almost as small as those caused by Brownian motion, which is the irregular movement of particles suspended in gas or liquid and bombarded by molecules or atoms. 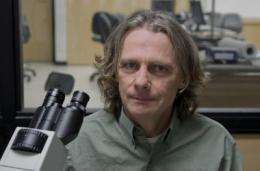 Richard Rabbitt, professor and chair of bioengineering at the University of Utah, led a study indicating that a mechanism known as "flexoelectricity" works within the cochlea of the ear to amplify quiet sounds. Bundles of tiny hair-like tubes called stereocilia dance back and forth atop "hair cells" in the cochlea, serving as "flexoelectric motors" to amplify sound mechanically. Rabbitt says it is like power steering for your hearing. Credit: University of Utah College of Engineering. Hair cells are inside the inner ears of many animals. 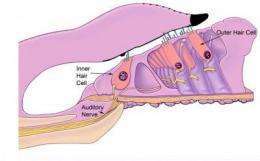 They are within the ear's cochlea, which is the spiral, snail-shell-shaped cavity where incoming sound vibrations are converted into nerve impulses and sent to the brain. Incoming sounds must be amplified because incoming sound waves are "damped" by fluid that fills the inner ear. Hair cells are about 10 microns wide, and 30 to 100 microns long. By comparison, a human hair is roughly 100 microns wide. A micron is one-millionth of a meter. The hair-like stereocilia tubes poking out the top of a hair cell are each a mere 1 to 10 microns long and about 200 nanometers wide, or 200 billionths of a meter wide. Brownell says the new study shows how the flexoelectric effect "can account for the amplification of sound in the cochlea." Stereocilia essentially are membranes that have been rolled into tiny tubes, so "the fact that a membrane can generate acoustic [mechanical] energy is novel," says Brownell. "Imagine hearing a soap bubble talk." Flexoelectricity in a membrane was noted a few decades ago when a researcher in Europe showed that flexing or bending a simple membrane in a laboratory generated an electrical field. Then, in 1983, Brownell showed that a hair cell from a guinea pig's ear changed in length when an electric field was applied to it in a lab dish. The length of stereocilia changes along the coiled length of the cochlea. Different lengths are sensitive to different frequencies of sound. And different animals have different ranges of stereocilia lengths. Breneman and colleagues devised math formulas and used computer simulations to arrive at the new study's key finding: The flexoelectric amplifier can explain why varying lengths of stereocilia predict which sound frequencies are heard most easily by a variety of animals, from humans to bats, mice, turtles, chickens and lizards. "They found that a longer stereocilium was more efficient if it was receiving low-frequency sounds," while shorter stereocilia most efficiently amplified high-frequency sound, Brownell says. Breneman says scientists now know of five ways the ears amplify sound, and "what makes this one unique is that it would be present in the stereocilia bundles of all hair cells, not only outer hair cells." The cochleae of humans and other mammals have "inner hair cells" that sense sound passively and active "outer hair cells" that amplify sounds. Other higher animals have hair cells, without a distinction between inner and outer. Because the new study shows the dancing hair-like stereocilia act like an amplifier on any hair cell, "it explains how this amplifier may work in all higher animals like birds and reptiles, not just humans," Rabbitt says. When sound enters the cochlea and reaches the hair cells, sound pressure makes the hair-like stereocilia tubes "pivot left or right similar to the way a signpost bends in heavy wind," Breneman says. The tops of the tubes are connected to each other by protein filaments. Where each filament comes in contact with the top end of a stereocilium tube, there is an "ion channel" that opens and closes as the bundle of stereocilia sway back and forth. When the channel opens, electrically charged calcium and potassium ions flow into the tubes. That changes the electric voltage across the membrane encasing each stereocilium, making the tubes flex and dance even more. Such flexoelectricity amplifies the sound and ultimately releases neurotransmitter chemicals from the bottom of the hair cells, sending the sound's nerve signal to the brain, Breneman says. "We've got these nanotubes - stereocilia - moving left and right and converting electrical power [from ions] into mechanical amplification of sound-induced vibrations in the ear," Rabbitt says. He says the "flexoelectric motor" is the collective movement of the stereocilia in response to sound. Brownell says the new study - showing that sound is amplified by "dancing" membrane tubes atop hair cells - adds to growing evidence that membranes do not "just sit there," but instead are "dynamic structures capable of doing work using a mechanism called flexoelectricity." Brownell and Rabbitt note that stereocilia involved in amplifying hearing have similarities with other tube-like structures in the human body, such as villi in the gut, dendritic spines on the signal-receiving ends of nerve cells and growth cones on the signal-transmitting axon ends of growing nerve cells. So they speculate flexoelectricity may play a role in how villi in the intestines help absorb food and how nerves grow and repair themselves. "There is some evidence that dendrites and axons change their diameter during intracellular voltage changes, and that could well have flexoelectric origins," says Rabbitt. "Any time you have a membrane with small diameter - like in axons, dendrites and synaptic vesicles [located between nerve cells], there will be large flexoelectric forces and effects. Therefore, the flexoelectric effect may be at work in things like learning and memory. But that's pretty speculative." Interesting, I wonder if the mechanism can possibly run amok and be another reason for tinnitus.